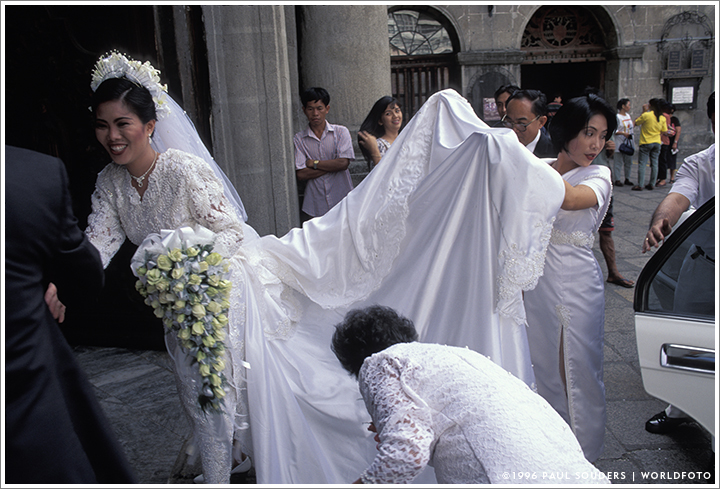 A young bride accepts congratulations before her wedding at the Catholic cathedral in Manila’s Intramuros neighborhood. Photographed February 15, 1996 with a Nikon F4 camera and 28mm f/1.4 lens on Fujichrome slide film. This entry was posted on Thursday, February 15th, 1996 at 6:44 pm. It is filed under On the Road and tagged with Asia, Philippines, Street Scenes. You can follow any responses to this entry through the RSS 2.0 feed.